LTE is the next step in the user experience, enhancing more demanding applications such as video streaming, video conferencing, video chatting, advanced gaming and professional services. Ensuring high quality mobile video transmission is essential and needs to be verified throughout the development process for end user devices. 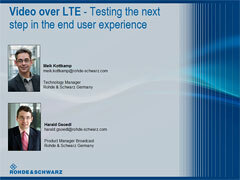 This webinar will illustrate how to establish and test the LTE video transmission link. Additionally, and equally importantly, it will show how the quality of the video transmission links can be measured under real-life propagation conditions and which metrics can be used to accomplish this task.